Barbara Cornett is originally from the Chicago area. She has had a vacation home in Fairfield Bay and this area for the past 25 years. Husband John and Barbara now make this their permanent residence. A few years ago they began building their retail store on their property with the intent of opening a stained glass studio and retail store. In December of 2014, they opened “BC Stained Glass LLC” for business. Barbara was a police officer in a Chicago suburb of Illinois for 20 years and then went to work for the Teamsters Labor Union. She retired from the position of a principal officer of Teamster Local 700 in Chicago in 2014. Barbara began doing stained glass approx. 15 years ago and then began doing fused glass a short time later. She started taking lessons from Grace Austgen (a very accomplished stained glass artist) in Elgin IL. She has continued with various classes taught by widely recognized artists from all over the country and Canada who teach the latest new techniques in glass to art glass retailers. Barbara travels several times a year to Chicago to attend ongoing education classes so she can stay current in the field of both stained glass and fused glass and bring these new techniques back to her customers. Barbara does not have any formal art education. She spent lots of time in her studio trying new ideas and has learned many things through this self-taught method. She began doing stained glass because of wanting a piece of stained glass for a window in her home and thought she would try to learn to make it herself. She found it to be very interesting and relaxing. As soon as that first piece was finished, she was on to the next one, and so it has continued all these years. She is really enjoying having a studio environment for her store. She sells glass and supplies as well as provides a place where you can create your own project or just come in and see how stained glass is made. She also creates commissioned stained glass and fused glass art and enjoys helping customers bring their ideas to reality. 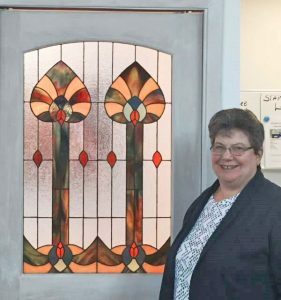 The logo for her business is a picture of a window she created that won first place in a contest held by an International online stained glass blog site. She was nominated for the Arkansas Living Treasure Award in 2016. Barbara participates in several art shows throughout the year. This year she will be participating in the Heber Springs’ Spring Fest, Fairfield Bays’ October Fest and War Eagle Art and Craft show in October. She travels to Arizona in the winter to participate in art shows in Scottsdale, Chandler and Gilbert AZ. Her work is available at the NCA Art Gallery Exhibit and the Possibilities Gift Shop in the Conference Center at Fairfield Bay as well as Ritzy Rags Store in Mountain View, AR and in the First Street Galleria in Carefree, AZ and at BC Stained Glass in Shirley. She creates glass art because she finds it a great outlet for creativity. A stained glass piece changes in looks depending on the amount of light coming through it, and so it is constantly changing with the time of the day. A piece of glass art can evoke an emotion or vibe by the color and density of the glass used in making the piece. She finds that a very appealing aspect of the art. Her fused glass art has for me been a never ending fascination of creating color by combining different glasses and using heat to create movement in glass. The North Central Arkansas (NCA) Art Gallery’s mission is to bring quality Fine Art to our community with good taste & family values. The artists are professionals as well as emerging new artists. The artwork is open to all Artist and chosen by a selection committee under the direction of Coordinator, Charlotte Rierson. Art Gallery hours are Mon. Thru Sat. 9:00-4:00 unless special events or conferences then the hours will be extended. The viewing of the Art is open & free of charge to the public. All art is available for purchase. The NCA Art Gallery is sponsored by the North Central Arkansas Foundation for the Arts & Education (NCAF&E) and The City of Fairfield Bay. For more information contact NCA Art Coordinator, Charlotte Rierson: 501-884-6100, email [email protected] or Conference Center Directors, Wilba or Bob Thompson [email protected], for more information: 501-884-4202, 110 Lost Creek Parkway, Fairfield Bay, AR 72088.